Wondering what to make for dinner? 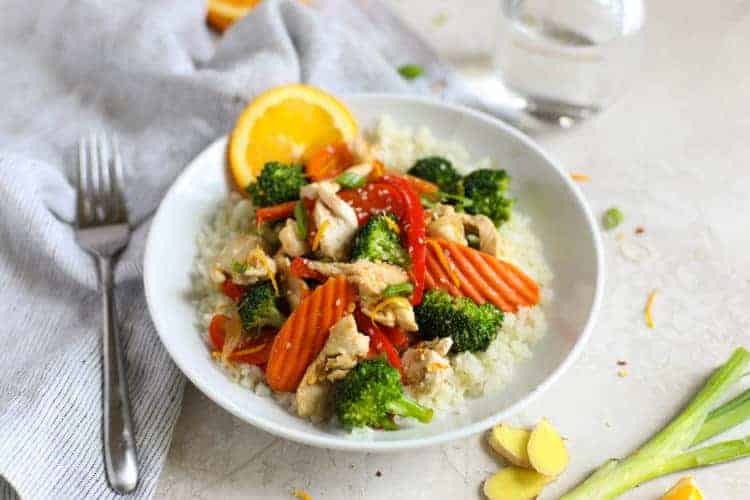 Wonder no more, this Orange-Ginger Chicken Stir Fry is on the table in under 30 minutes. Saturdays are for stir-fries at our house. They’re incredibly simple to make and everything can easily be prepped ahead a few days in advance. We can get dinner on the table, hot and ready, in under 30 minutes, which is perfect for busy weekend days when we’d rather be out mountain biking or skiing right up until dinner time than home cooking. They’re a great way to sneak more veggies into a meal while using up what’s in the crisper before it’s time to grocery shop for the week ahead. I will say this though, that while the adults in my house are fans of every veggie known to man tossed into a hot skillet, my kids are not. They are not the mega-veggie lovers I’d hoped they’d be (yet! 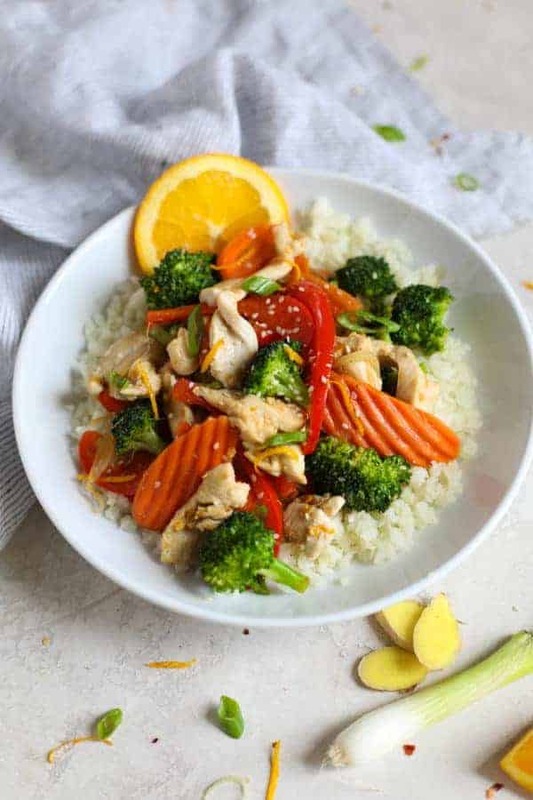 ), but they WILL eat their fill of this Orange-Ginger Chicken Stir Fry. 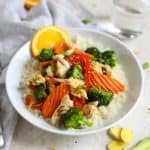 This Orange-Ginger Chicken Stir Fry is just sweet enough thanks to the fresh orange juice and I always include at least two veggies I know they’ll eat, like broccoli and carrots. I don’t stress it if they pick out the other veggies but I do ask that they take a ‘fairy bite’ of each kind just so they get a taste. Because you never know, what’s today’s dreaded veggie may be tomorrow’s favorite veggie when it comes to kids. It’s also light enough to fill you up without weighing you down. No heavy, starchy sauce here – just a sweet and salty sauce to complement the flavors of all those veggies. The perfect oil for high-heat cooking. I have to admit that I’ve long been unsure of which oil was the best oil for stir-frying so I’ve experimented with quite a few. Some imparted a flavor to the food that I wasn’t keen on and others smoked at the high temps required for stir-frying. 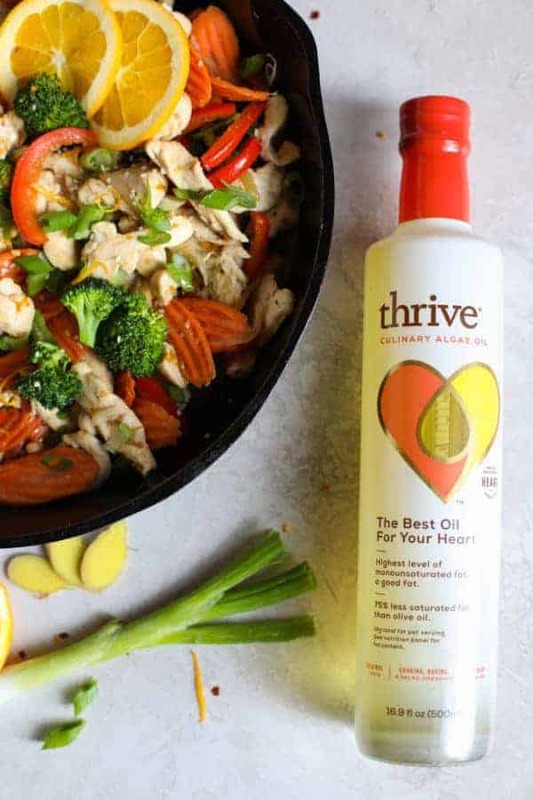 So when our friends at Thrive Culinary Algae Oil reached out and asked if we’d be up for creating something delicious with their oil, I was totally game to give it a try since my stir fry game was in the balance here. As it turns out, the oil I was a little skeptical about (I mean, algae!?) is a champ when it comes to stir-fries thanks to its light, neutral flavor and high smoke point (up to 485℉). What gives it that great smoke point is the fact that it contains 90% monounsaturated fats (MUFAs). I’ve also been loving it for roasting vegetables, marinades and dressings and will be testing several new recipes with it in the months to come. 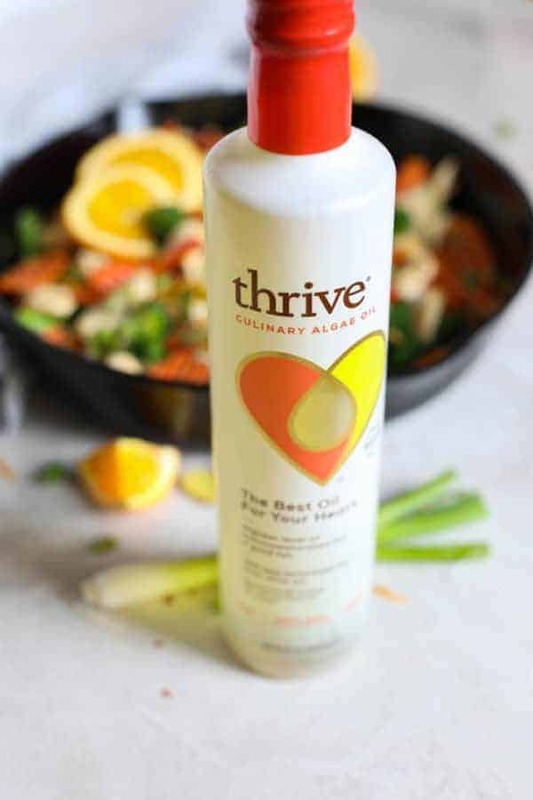 I’m also loving the fact that Thrive Culinary Algae Oil is sustainably produced and has a lower carbon footprint than many other cooking oils. Good for you and good for the planet. 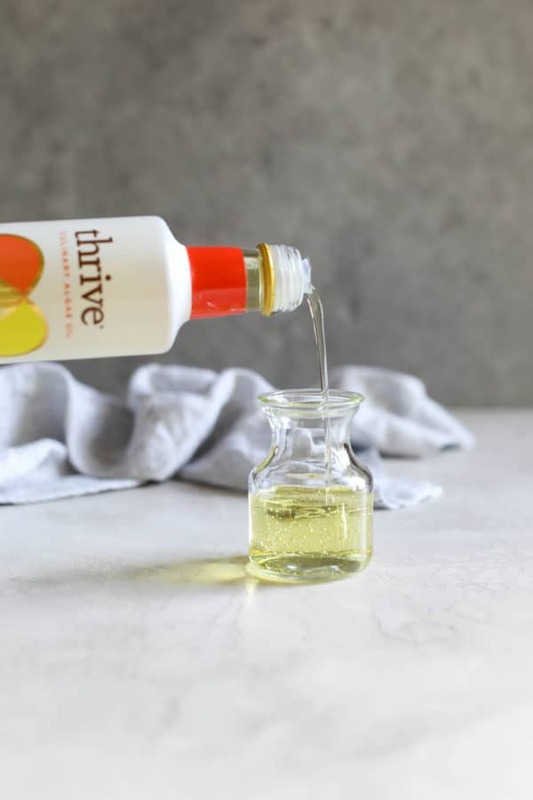 You can learn more about Thrive Culinary Algae Oil here and use their store locator to find it at a store near you. 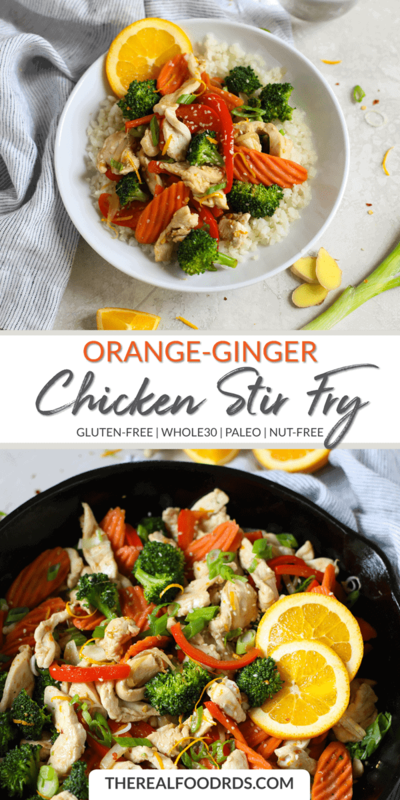 Though this Orange-Ginger Chicken Stir Fry stands on its own as is, feel free to swap out the veggies called for in the recipe for those you already have on hand if one of your goals is to clean out the crisper before your next shopping trip. Use roughly the same number of cups of vegetables as called for in the recipe to ensure you have enough sauce to go around and that you don’t overcrowd the pan. Cut vegetables into pieces of similar size so they cook quickly and uniformly. Start onions and heartier veggies – like carrots, celery, Brussels sprouts, and mushrooms – to the pan first as these need a little time to cook before they become crisp-tender. Add broccoli, peppers, snow peas, asparagus, green beans, water chestnuts (drained) and the white part of green onions next. Add minced garlic and ginger just before you add the sauce to prevent it from burning at high heat. Just 30 seconds in the pan while continuously stirring is enough to release the flavors without it burning (or tasting too pungent when it’s time to eat). Add tender veggies like bok choy, thinly sliced cabbage, thinly sliced green onion tops, or other leafy greens to the pan last since they need just a few moments to wilt before serving (this keeps them crisp-tender and brightly colored). Garnish with your favorite ‘sprinkles.’ At our house, we like sesame seeds, red pepper flakes, garlic gomasio, chopped cashews or almonds and/or toasted seaweed. 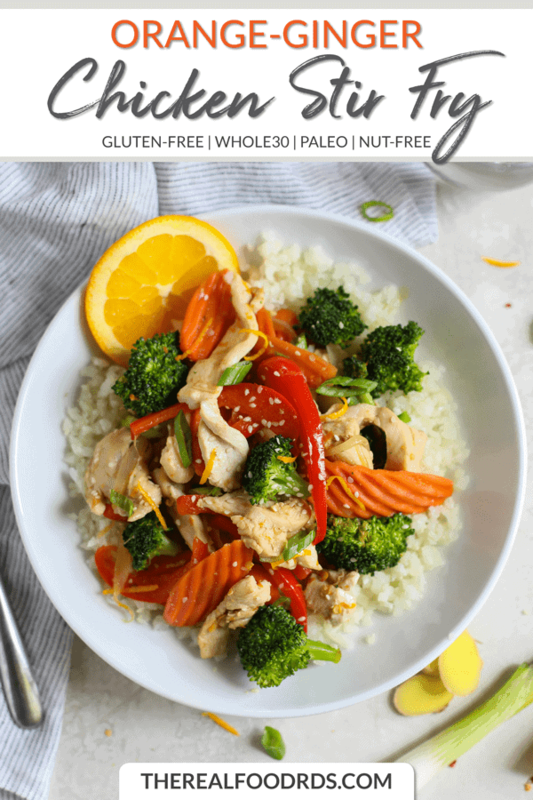 Get creative – stir fry ‘sprinkles’ are a great way to add crunch and healthy fats. Optional toppings: Chopped cashews or almonds, crumbled toasted seaweed, sesame seeds or gomasio. Combine coconut aminos, orange juice, zest, water and garlic, and ginger if using the dried form, (if using fresh, reserve for later) in a small bowl. Set aside. Heat ½ Tbsp. oil in a large sauté pan, wok, or skillet over high heat (medium-high if using a cast iron skillet). Add half of the chicken and cook until no longer pink in the center. Remove chicken to a plate and repeat with another ½ Tbsp. oil and remaining chicken. Wipe pan clean (if desired) before adding ½ Tbsp. oil. When the pan is hot, add onions and carrots and stir-fry for 3-4 minutes. Add broccoli and peppers, continue to stir for another 3-4 minutes, then add fresh garlic and ginger, if using, and cook another 30 seconds or until fragrant. Add chicken back to the pan with the vegetables then pour sauce over everything. Stir to coat, add green onions and cook for an additional 1-2 minutes until meat is warmed through and vegetables are tender to your liking. Serve over cauliflower rice for a Whole30-friendly option or with rice or rice noodles, if desired. *Feel free to use 6 cups of any combination of vegetables – cabbage, zucchini, snap peas, green beans, water chestnuts, celery, asparagus etc. to suit your tastes or use up what you’ve got on hand. What’s your go-to meal when you want something quick and easy? How about when you want to clean out the crisper? Share in the comments below.